Jameel has expressed reservations about Gidon Sa'ar's new bill that would dock a day's pay from anybody who doesn't vote on election day. Jameel is not so comfortable with punishing non-voters, and neither am I. Imagine: You could get hamin at the Shas booth, kugel at the UTJ booth, humus at the Arab parties, borsht by Lieberman, geriatric food at Gil, and sushi at Meretz. (If the Third Way was still around, I'm sure they'd serve bread in a pita, and Shinui would offer a spread of shrimp and lobster.) Kadima can offer free drinks from their mini-bars, and they'll probably promise the most "fun" food to eat (but everyone who does will develop an upset stomach by the time they get home...). Democracy in Action: Vote...or else. Current Status: The National Election Day in Israel is already considered a paid vacation day (national holiday) for anyone who works. Proposed Amendment by MK Gidon Sa'ar: Any employed person who does not vote in the national election day, will be penalized, and have their pay deducted (equivalent to one day's work). Result: Its the equivalent of a fine if you don't vote. Over time, the percentage of voters from the eligible voter population has been decreasing from the founding of the State (86.9% voting...and decreasing to the last election in 2006 with only 63.5%). So, should one be "forced" to vote? While I'm in favor of voting, I'm not sure this is the best way to education people about democracy. The Ima has come through again with Haveil Havalim #171: The Packing for Camp Edition. Amid the backdrop of a terrible human tragedy, the Israeli cabinet approved Sunday the prisoner exchange deal with Hizbullah, which will facilitate the return of IDF captives Eldad Regev and Ehud Goldwasser. Despite all the announcements to the families of Regev and Goldwasser, Israel's intelligence community changed it's mind over the past few weeks and their assessment is that the 2 missing IDF soldiers are dead. In return for the 2 [dead?] soldiers, among those Israel will be releasing is the notorious Samir Kuntar. In an incredible show of personal dignity, Smadar Haran, the widow of Danny Haran (murdered by Kuntar) wrote to Israel's Internal Security Minister Avi Dichter stating she had no objections to Kuntar's release. The letter was read at today's cabinet meeting. "The despicable, vile murderer Samir Kuntar isn’t, nor has he ever been, my private prisoner. Kuntar is a prisoner of the State, which sentenced him to five terms if life imprisonment for his vicious crimes," she wrote. "His fate must be decided now, according to Israel's best defensive needs and moral interests, which should serve the people of Israel, now and in the future. "I ask that my own personal pain not be taken into account when you deliberate, despite its significance and implications. I cannot overlook the pain and suffering of the Goldwasser and Regev families, or the moral debt I have to all those who have worked for my safety. To get an idea of what sort of human garbage we are talking about, this is what Smadar Haran wrote in the Washington Post in May 2003. It is must reading to appreciate her current position. Abu Abbas, the former head of a Palestinian terrorist group who was captured in Iraq on April 15, is infamous for masterminding the 1985 hijacking of the Italian cruise ship Achille Lauro. But there are probably few who remember why Abbas's terrorists held the ship and its 400-plus passengers hostage for two days. It was to gain the release of a Lebanese terrorist named Samir Kuntar, who is locked up in an Israeli prison for life. Kuntar's name is all but unknown to the world. But I know it well. Because almost a quarter of a century ago, Kuntar murdered my family. It was a murder of unimaginable cruelty, crueler even than the murder of Leon Klinghoffer, the American tourist who was shot on the Achille Lauro and dumped overboard in his wheelchair. Kuntar's mission against my family, which never made world headlines, was also masterminded by Abu Abbas. And my wish now is that this terrorist leader should be prosecuted in the United States, so that the world may know of all his terrorist acts, not the least of which is what he did to my family on April 22, 1979. Outside, we could hear the men storming about. Desperately, we sought to hide. Danny helped our neighbor climb into a crawl space above our bedroom; I went in behind her with Yael in my arms. Then Danny grabbed Einat and was dashing out the front door to take refuge in an underground shelter when the terrorists came crashing into our flat. 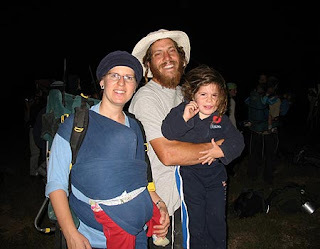 They held Danny and Einat while they searched for me and Yael, knowing there were more people in the apartment. I will never forget the joy and the hatred in their voices as they swaggered about hunting for us, firing their guns and throwing grenades. I knew that if Yael cried out, the terrorists would toss a grenade into the crawl space and we would be killed. So I kept my hand over her mouth, hoping she could breathe. As I lay there, I remembered my mother telling me how she had hidden from the Nazis during the Holocaust. "This is just like what happened to my mother," I thought. 1. The State of Israel gave up thousands of terrorists over the past 15 years to support the Oslo process which has brought nothing but the deaths of thousands of Israeli civilians and soldiers. Rockets continue to pound Southern Israel from Gaza, and terror continues unabated from the West Bank. And in return for giving away thousands of Palestinian terrorists and criminals, we have received exactly nothing. If we are able to tangibly receive captured IDF soldiers (living or dead) by exchanging them for Palestinian terrorists and criminals, then we have a moral responsibility do so. If we "sacraficed" so much for the failed promises of Oslo, then the least we do is get our soldiers back. 2. IDF soldiers grow more cynical daily as they see corrupt leaders of the likes of Ehud Olmert zig-zag on every decision possible. Ensuring the return of Goldwasser and Regev will send a signal to IDF soldiers that despire the corrupt leadership, the country is still willing to "pay the price" for their release. We will not leave them behind, as we have done so often for the past 2 decades. We owe it to our soldiers -- we ask them to fight for us. The least we can do is bring them home. 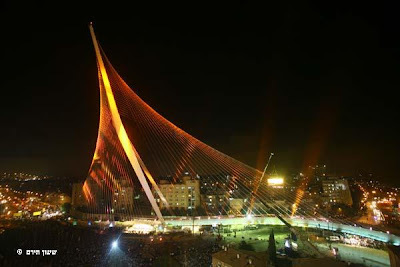 I can't compete with the "Great Toothpick in the Sky" line, but here are some pics of the Jerusalem Bridge of Strings from last nights ceremony, courtesy of the Jerusalem Municipality. Quite breathtaking. Of course there's nothing like a little controversy, like when the girls dance troupe were told to cover up their performance. I can be proud of my daughter's graduation tonight from sixth grade and that she is starting "Ulpana" (Jr. High). Not proud that she "graduated" (its pretty hard to not graduate from 6th grade) -- but proud of the actual, impressive ceremony. In fact, it was as if the Muqata blog had written and directed the entire evening; sound, light, video, effects, Eretz Yisrael all rolled into one (though no one was wearing a yellow smiley face). The "theme" of the evening was the "impending redemption" -- and the boys and girls had separate presentations (they aren't mixed in school either). The primary artistic presentation was about a class going on a forced museum trip, where they encountered different historical characters who came alive at the mention of the word "Geula" -- redemption. (The smoke machine and strobe added some cool effects). Avraham Avinu proudly congratulated them for building up the land, and proving G-d's promise of לך אתן את הארץ הזאת -- "to you I will give this land". The class comforted Rachel the Matriarch that her children were returning from Exile and rebuilding the land. How poignant was it that the class reminded her that some children were still missing and needed her prayers; Gilad Shalit, Ehud Goldwasser, Eldad Regev, Ron Arad... how current events mesh with our lives...and we don't even forget our missing soldiers -- even at a 6th grade graduation. The class met a group of Jews...who were going to trash the store of "Shmuel the Shoemaker" -- because he was working on Shabbat. R' Kook arrived on the scene and told the crowd that only through "Ahavat Chinam" would the redemption come. Yoni Netanyahu met the class as well -- one who gave his life for Ahavat Chinam -- on behalf of the Jewish people in his daring rescue mission at Entebbe. Ben-Gurion, Naomi Shemer, and others characters met the class, all through the theme of "redemption" -- how close it is...how close it can be. the light continues to grow..."
As the play ended, the sounds of the shofar erupted from all corners of the gymnasium. May we merit redemption soon -- I could not be more proud of my daughter, her class, and her school. Living the dream day by day, in Israel. At the age of 32, Laizy Shapira is still single. It wouldn’t be so crucial if he were a professional Tel Avivian, but Shapira is a religious man who lives in Jerusalem and leads his sentimental life there, passionately claiming that the capital is the perfect place for a religious pick-up, just like Tel Aviv is the capital of secular pick-up. "Jerusalem for the religious is like Tel Aviv for the seculars," he explained. "A religious person over the age of 20 who has yet to marry will find himself there. Shavuot, for example, is one of the greatest bachelorhood holidays, when everyone goes on a pilgrimage to Jerusalem, to the synagogues and our entertainment centers. "In Jerusalem, by the way, you can find a larger number of girls wearing pants, you will find much more pluralism. It's really different from the image you have of it. It's just like Tel Aviv, with coffee shops, kosher bars and synagogues which are the center of our scene. Last night I was thinking; was this show just a "Jewish/Israeli" version of "Friends" or "Seinfeld"? It could have been, but isn't -- it's much more serious and introspective, and not written as a comedy. Would such a show even work in the US, based on the Upper West Side, Jewish Singles Scene -- if there wasn't a laughtrack constantly running throughout the show? Laizy based lots of show on the real life experiences of him and his friends. "My series is the most reliable religious thing I've seen on the screen. Every time religious people are presented on the screen, the skullcap is in the wrong angle or the text doesn’t make sense. I was strict with every single detail. Even the skullcaps were knitted by my niece." He may deny it, but Shapira created the series mainly for himself, and perhaps in order to meet new girls. The majority of the "Srugim" plot is derived directly from his daily life as a 32-year-old bachelor who has gone on dozens of dates but has yet to find the one. This may sound like a plot for another of the dating series sweeping the screen, but in Shapira's world this is a real crisis rather than romantic caprices. "I have gone on many dates over the past decade," he says, "and after turning 30 my parents lost hope. They show a lot of support for what is happening to me now, but manage not to mention the wedding issue. They know I'm working on it." And why shouldn't he make a TV series, if it gets him a shidduch? FrumSatire's trying to do the same thing with HIS blog. Good Luck Laizy -- we're rooting for you! Welcome to the Muqata. I am Jack, one of the inmates that haunt this joint and I am pleased to take the helm for a moment. I have had the privilege and the pleasure of being a friend of Jameel's for a short while now. During that time we have had all sorts of cool adventures. But the coolest and best of them all was that crazy day in Tel Aviv when we go to dance with Matt. If you click here you can watch the video. We're on at about 3:42 or so. If you look carefully you can see Joe Settler doing the cleveland clap step in the back. It is indeed a wild and wacky world. Israel's internet chats, blogs and media gave a resounding two-thumbs-up to Laizey Shapiro's "Srugim" TV series which debuted last night on YES TV. To the religious viewer, one could laugh, squirm, and ponder at many of the oh-too-familiar scenes in the show -- demonstrating the impressive quality of the acting, writing, and direction. Normally, Israel's "artsy media" with their traditional anti-religious bias would have a field day with a TV series about religious singles, produced by a religious director. Yet the series has produced rave reviews from "Achbar Ha'ir", Maariv, NRG, and many others -- attesting that this series appeals to both Israel's religious and secular worlds. Obviously, for the sake of the script, not every scene is typical of the Jewish "Bitza" (Swamp) Katamon singles scene, yet the familiarity allows for every scene to be believable -- and if it didn't happen to you personally, you know people that it could have happened to. A guy's "tefillin request" sends him to the next door neighbor, where an American accented Hebrew speaking young lady offers HER tefillin to him. Shocked, he returns to his girlfriend and angrily responds that he wasn't looking for a Reform Lesbian's tefillin...but for real tefillin. His girlfriend dumps him rather quickly...and you can easily imagine the scene in Jerusalem. Everyone says the Shabbat meal scene is slightly uncomfortable to watch, because everyone's been there. Anyone who's ever been single in Jerusalem knows about singles Shabbat meals, where everyone tries and hopes to meet their intended life partner. Sometimes awkward and clumsy, the Shabbat meal is can be a neccessary evil in the Katamon singles scene. Here is a brief clip of one of a Shabbat meal in yesterday's episode. Speaking to Srugim director, Laizy Shapiro today by phone, he told me that it was really an exceptional experience making the show, and that there was a special atmosphere with the secular actors when filming...and he said the show could be a bridge between the religious and secular. Judging from the favorable reactions of the newspapers, I believe he's correct. I wonder how the singles scene in Jerusalem will feel about being reflected in this TV series. Despite the skeptics, Israel is truly a modern miracle. Hebrew has been revived and is a thriving, vibrant language. 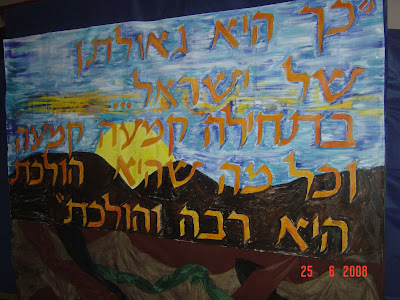 While Yiddish still thrives, it is obvious to all that Hebrew is the common language of the Jewish people. One of the sweetest aspects of Hebrew's rebirth are idiomatic expressions based on Jewish history and religion. One of the newest expressions flying around the country now (introduced to me by my brother-in-law in the IDF this past Friday), is "עף לי הסכך" -- my "schach" has blown away, or in modern slang, "I was blown away." On a physical level, the deserts have bloomed and the trees of Israel have welcomed home the Jewish people with fruits, produce, and agricultural bounty after a 2000 year hiatus. Yet the miracle continues; the Judean Date Trees, the extinct species of large, sweet dates that once populated Eretz Yisrael is carefully undergoing a miraculous rebirth as well. Scientists in Israel have confirmed that an ancient date palm seed retrieved from the rubble of Masada and successfully germinated is about 2,000 years old. That makes it the oldest seed ever to sprout, beating the previous well-documented record holder, a lotus found in a dry lakebed in China, by about 700 years. The date seed was among several obtained in the 1960s by archaeologists excavating Masada, the fortress in the Judean Desert built by Herod around 35 B.C. and destroyed by the Romans in A.D. 73. In 2005, three seeds were planted by Sarah Sallon of the Louis L. Borick Natural Medicine Research Center, part of the Hadassah Medical Organization in Jerusalem. One seed germinated, and three years later, Dr. Sallon and colleagues report in Science that the resulting plant is healthy and more than three feet tall. 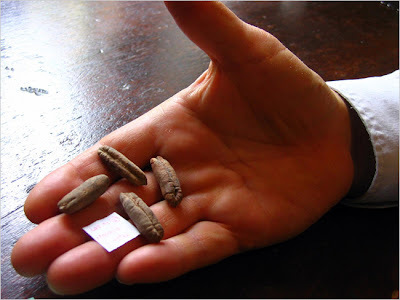 Radiocarbon testing of shell fragments of the seed obtained when the plant was repotted at 15 months show that it dates from the time of Masada. The researchers say that the high summer temperatures and lack of rainfall in the desert may have helped keep the seed viable for so long by reducing the generation of free radicals, which cause oxidative damage. The Judean Dead Sea region around the first century A.D. was well known for its date palms that produced fruit of high quality, but over the centuries this line of plants was lost. Genetic analysis of the germinated seed has provided just limited information about this ancient line. The researchers say more seeds are needed for a more thorough understanding of what made those old dates so good. Assuming the date tree bears fruit, and is female** the researches hope to repopulate Israel with these trees. We can add this to the list of amazing accomplishments of modern Israel...along with the revival of the mitzva of tekhelet. Israel: Where the extinct is reborn. The revival of this once-extinct species may yield some very important information, and may lend itself to more uses than just cuisine. Judy Siegel-Itzkovich, the Jerusalem Post's medical correspondent, reports that "the date project is part of the NMRC's [Natural Medicine Research Center] Middle Eastern Medicinal Plant project aimed at conserving, developing and researching the rich legacy of medicinal plants in Israel. The extinct 'Judean date' is regarded by NMRC as having particular importance". This is because the Judean date "was renowned in ancient times as a treatment for heart disease, chest problems, the spitting of blood, weakened memory and other medical conditions, possibly even symptoms of cancer and depression." So it is entirely possible that the anticipated revival of these dates may portend the development of new medical treatments. **Dioecious (Male and Female) Date Trees. I was unaware that some fruit trees are male and female. Such is the wonder of blogging - you can learn something new every day! 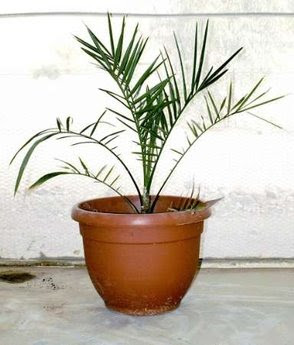 The date palm represents the earliest recognized example of the dioecious condition. As early as 3500 B.C., the farmers of Mesopotamia recognized that there were male and female trees and practiced artificial pollination by bringing clusters of male flowers in contact with female flowers. The methods of bringing about fruit production in the date palm today differ little from those practiced in ancient times. Male trees to provide pollen are grown with female trees, which bear the fruit. In Arabic lands, the cutting of male trees was practiced when war was being raged between tribes. The opposition would sneak into their enemy's palm grove and destroy the male trees. As a result no fruit would be produced. Since dates were a stable item of the diet, starvation was induced. The reason for removing only the male tree was that only a few were needed for a large palm grove. It did not require as much time or effort to remove the male trees as it would have required to remove the more numerously planted females. Tonight on YES TV (YES STARS Channel) at 10 PM marks the debut of the "Srugim" TV series, directed by Laizy Shapiro. Focusing on the religious singles scene in the Katamon area of Jerusalem, "Srugim" tackles many situations including; joint shabbat meals, young divorced singles, being shomer negiya (or not), life as a single when friends around you are all married with children, the dating scene, Ohel Nechama, and basically every situation of day to day life for Jerusalem's religious singles. Though the actors themselves are not religious, the director and screen writers are -- and they needed to quickly get the actors up to speed on what to do...and not do, as religious singles. The previews and behind the scenes show look promising, so this looks to be a decent show. Of course, personally knowing the director means I'm not biased in the slightest. If you're going to watch TV, don't waste your time with Hisardut/Israeli survivor trash shows - watch a quality series, by a talented director and graduate of Ma'aleh, Israel's religious film and art school. One particular issue which makes people get all queasy is that of organ donation after death. In the US, HODS (Halachik Organ Donation Society) is spearheading the effort for raising consciousness and educating people about organ donation, and halachik (Jewish religious law) options for organ donations. In Israel (as could be expected), the issue is even more controversial. The ADI organization is the exclusively approved organization responsible for cataloging potential organ donors -- and they issue cards for those willing to donate organs after death. Till a few days ago, the final word in the Chareidi world was based on the ruling by Lithuanian chief rabbi R' Yosef Sholom Eliashiv -- who adhere's to the traditional definition of death as occurring with the cessation of cardiac activity. This limits vastly the range of organs that can remain viable for donation. 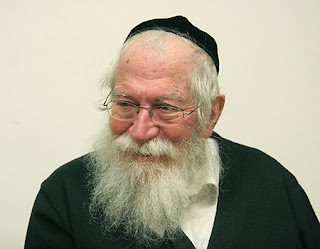 However, in what is being viewed by many as a potential earthquake to the Chareidi world, R' Zalman Nechmia Goldberg (bio in Hebrew here -- pictured above), scion of a Lithuanian Jewish family (and son-in-law of R' Shlomo Zalman Auerbach), has given a dissenting opinion that religious Jews may sign the ADI card, yet should use the check box "organs may be donated only after approval from a religious authority of the family's choosing." R' Goldberg adds that the card should be modified to include the specific Rabbi the family should consult with. Though there are many Orthodox Rabbis who have signed up for the ADI card or through HODS (great list with pictures of Rabbis and ADI cards here), the ruling by R' Goldberg has the potential to change the current Chareidi mindset towards Organ Donations as well. Yes, it makes me queasy to think about the topic, but I still signed up for the card. Save a Life -- Sign up in Israel for an ADI card, here. 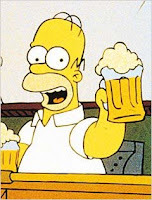 More information about HODS in the USA, here. List and pictures of Donors, Recipients who lives were saved by organ donations. So I figure I should keep looking further back to figure out where exactly my native home is. This might take a while and some serious research. So now this is what I am afraid of. What if, at the end of all the exhausting research, I find out when I trace my ancestry all the way back to when the Hebrews entered the land of Canaan, that my family lived in a little hut in Efrat! Thanks to Jameel and Lurker for the warm welcome at the Muqata! As the Shabbat of "Parashat Shalch" (the weekly portion of the "spies") approaches, I'm thrilled to report that yet another Community Rabbi has announced to his community that he is making aliya. Rabbi Ari Berman of the "Jewish Center of Manhattan" is making aliya and remaining in Israel after a year's sabbatical from his shul and community. "As you know from my public and private talks, my personal connection to Israel is visceral and heartfelt. In truth, it would be difficult for any Jew with any level of historical consciousness not to be emotionally connected to Israel. Defying all historical probabilities, our people have returned to our homeland and, as such, we who live today have the duty and the privilege of playing a role in the Jewish story and advancing our people's historic destiny. This past year, living in Israel as a resident instead of visiting as a tourist, has given me new insight into the issues and challenges that Israel confronts. And there are many. But even though Israel is not always an easy place, never a simple place, certainly a complicated place, it is still our place. The rhythm of life, the face of the public square, the culture and undercurrents of society are all rooted in our tradition and heritage. Raising a family in Israel comes with a very different set of challenges than living in the Diaspora, but it also carries with it a very different set of rewards. Before The Jewish Center offered me the opportunity to spend a year of study in Israel, I mentioned to our leadership that it might be difficult for me to leave Israel. I knew that my connection to Israel would only intensify and that the opportunity to raise my children in Israel might be too difficult to let pass. When I think of the land of our fathers and mothers, my focus naturally shifts to my sons and daughter, and my hope that they will learn to see Israel as not just their homeland but also as their home." The Zohar asks, how could the Israelite spies from the desert, who were such great leaders of Israel, speak such slander about the promised land? The Zohar writes that the spies realized that if Bnei Yisrael would cross the Jordan immediately after the spies' return from their mission (which was the correct game plan), then the Beit HaMikdash would be built and a king would be anointed. There would be no destruction of the Temples, no Exiles, No terrible periods of tragedy for the Jewish people -- rather we would have immediately entered the period of ultimate geula. So what was the downside? The spies figured out that upon the anointment of a Jewish king, their leadership roles would disappear. In order to hang on to their political positions of power, they sacrificed the Jewish people for 38 more years in the desert, the destruction of 2 Temples, 2 periods of exile, and the deaths of countless Jews throughout the ages. According to the midrash, not only did the spies make their announcement to all of Israel, but they went from tent to tent to personally spread their message of gloom and doom if Israel would enter the promised land of Eretz Yisrael. How wonderful is it that we can see positive leadership this week -- Community Leaders announcing their aliya, actively demonstrating their love of the land. You too can correct the misdeeds of the spies -- and help spread the positive message of Eretz Yisrael to your family and friends. Deputy Defense Minister Matan Vilnai hit back Monday in the Knesset plenum at Gaza Belt residents who bitterly complained about the government's handling of the constant rocket and mortar attacks against their communities. 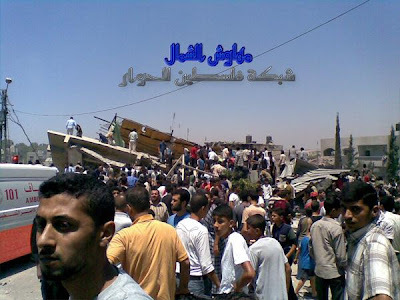 "We, here in Jerusalem, suffered hundreds of casualties, hundreds. You know that very well," he said. 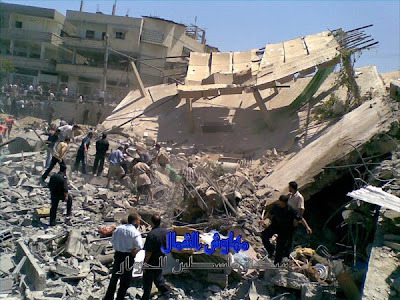 "In bus bombings and other maniacs trying to hit Israel at its very core, in our Jerusalem. Did we ever complain about not sleeping at night? Or that we cannot do anything? Or that we have been deserted? Have I ever contemplated anything of the kind as a Jerusalemite?" he demanded. 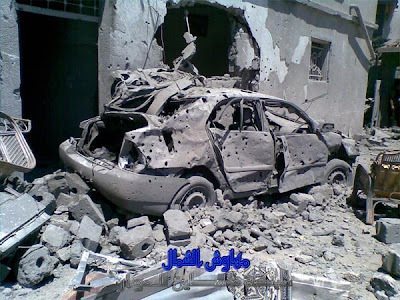 Israelis living in the Gaza Belt have lived with barrages of literally thousands of rockets exploding in their communities on a regular basis, sometimes daily, since the year 2000. I cannot imagine a statement that more dramatically exemplifies the obtuseness, callousness, and utter degeneracy of the Israeli government. I'm waaaay to busy to seriously post this week. Yet, when I get 10 emails with the same topic, I can spare 2 minutes to write this. There are youtube videos going around showing how you can cook popcorn between cellphones -- the obvious message being that cellphones are bad, scary, and they cook your brain based on the emitted radiation. The videos however, are fake. They were produced by a blue tooth headset company to scare you into using their product, to get millions of page views of their videos, and generate marketing/media buzz. For the record, you cannot "microwave", "cook", or "nuke" popcorn via 4 cellphones, or even cook an egg with 100 cellphones! In October 2005, the UK based Brainiac show demonstrated that it simply does not work. So the next time you get a scary looking video or internet email...check with Snopes. Reminder: The Summer Session at the Nishmat (The Jerusalem Center for Advanced Torah Learning for Women) is starting On July 1 (that's just 2 weeks away), so if you want to attend, you must register now. The summer session has Part-time and Full time options. Beginners: One-on-One Mentorship! Learn to read siddur, Chumash, Rashi, etc. Besides the Torah learning, there will be Tiyulim, Tours and Shabbtonim. There is even a scholarship if you qualify! 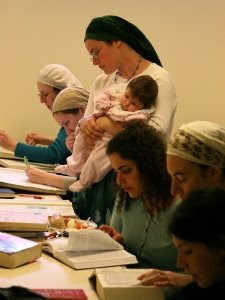 So whether you are in Israel or abroad, all you women reading this blog, go check out Nishmat because this is a great opportunity to learn Torah this Summer is an exciting and stimulating environment. In between celebrating Father's Day go check out Haveil Havalim #169 - Part I*. This morning, Israeli Police forces detained Tehilla Zolden for allegedly spending this past Rosh HaShana (7 months ago) with her family at the ruins of the destroyed Chomesh settlement in the Shomron Mountains. Since the police could not detain and question Tehilla's husband, Ido, who was murdered by PA policemen in a drive-by terror attack this past November, the Israeli police detained her instead. 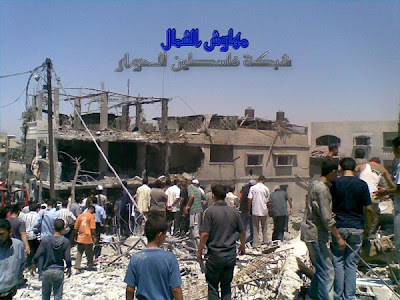 In August 2007, an Israeli court ruled that it was not illegal entering the ruins of Homesh. 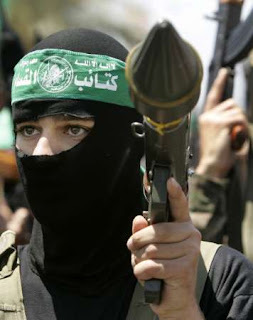 Why deal with Palestinian terror when it's so much easier to targets widows and orphans? This has been going around the media alot lately, but I waited to post it till the video was available with English subtitles. Link to YouTube Video here in case embedding isn't working well. YNET: It can be assumed that Al-Jazeera's top journalist Jamal Rayyan will not soon forget this year's Jerusalem Day, which was celebrated this week. Following reports of Israel's intentions to construct housing units in areas located beyond the Green Line (1967 borders), the news agency decided to hold an interview with Dr. Mordechai Keidar, a lecturer from Bar Ilan University's Department of Arabic Studies. The interview - in Arabic (and now subtitled in English) can be seen in full on youtube. Rayyan opened with the question, "Mr. Mordechai, is this decision meant to constitute another nail in the coffin of the Israeli-Palestinian negotiations?" The journalist appeared taken aback when Keidar answered, "To tell you the truth I don't quite understand this. 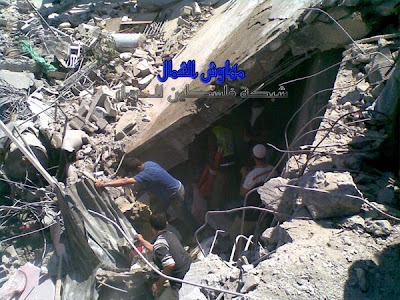 Must Israel ask permission from some other authority in the world? It has been our capital for 3,000 years. We have been there since the time your forefathers used to drink wine, bury their daughters alive, and pray to multiple gods." Keidar was referring to a period Arabs call Jahiliyyah (ignorance of divine guidance), which prevailed in the Arab world before the time of the Islam. "So then," he continued, "why must we speak about this? It has been our city for 3,000 years and will be for eternity." The stunned Rayyan refused to give up. "Excuse me Mr. Mordechai! If you would like to speak about history let's talk about the Kuran as well. You cannot deny the existence of Jerusalem in the Kuran! I ask you to refrain from making statements that offend Arabs and Muslims. Let's please stay with our topic," he said. "Jerusalem is not mentioned in the Kuran," Keidar said. Rayyan stated the verse that, according to Muslim belief, refers to Jerusalem, but Keidar continued to object. "Jerusalem is not mentioned in the Kuran even once." oppose the Road Map, which determines that Israel will halt construction of the settlements in Jerusalem?" "The Road Map does not mention Jerusalem," Keidar argued. "Jerusalem is outside of negotiations. Jerusalem belongs to the Jews, Period! We cannot discuss Jerusalem in any way. You return to this issue time and again, but Jerusalem is not referred to in the Road Map. My brother, go and read the Road Map." "At this rate Jerusalem will soon include all of the West Bank," Rayyan countered. "My brother, Israel does not involve itself in housing that Qatar constructs in the Qatar Peninsula," Keidar answered. "What do you want with Jerusalem? Jerusalem is ours for eternity and no one, not Al-Jazeera or anyone else, has any say in it. Jerusalem is solely a Jewish city and no one else has any connection to it." What a pity that Israel's polticians don't have guts to negotiate this way. 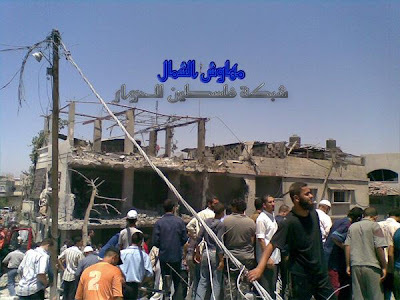 Palestinians reported that at least seven eleven people have been killed and 40 more wounded in a large explosion in northern Gaza on Thursday afternoon. 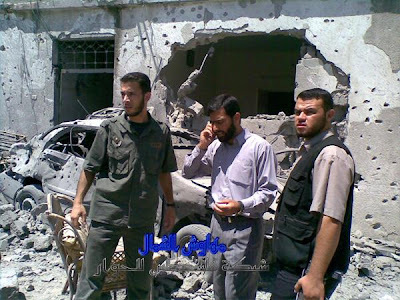 Hamas sources told Ynet that two of the seven people killed were senior operatives from the organization: Hassan Abu-Shakfa, one of the organization's commanders in northern Gaza, and Ashraf Mushtaha, another of Hamas' senior operatives. 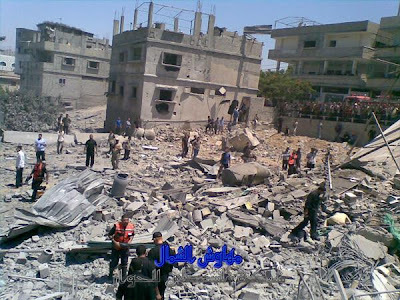 With over 50 rockets hitting Southern Israel today, I'm rather underwhelmed by the destruction in Gaza. Ooops. There went the neighborhood. This is just a reminder that submissions are needed for the next edition of Haveil Havalim, the weekly roundup of the Best of The Jewish/Israeli Blogosphere. You can do so by using the following link. Ahmed's bunker has surprises galore: Grenades, rifles are hung on the wall. Ahmed is planning another bomb! What a bunker Ahmed has, who causes daily harm. Ahmed knows how to make a bomb. Ahmed is Ahmed, that's who he is, so don't forget to be careful of him. We get blasted while they have a blast! Ahmed and his friends could be wealthy and sunny, if only they wouldn't buy rockets with all their money. The above poem was penned by a 10 year old boy from the Israeli town of Ness Tziona, yet banned at the order of Israel's Education Ministry. The poem was written as part of a poetry competition and was included in a booklet printed by the Ness Tziyona municipality. However, the YNET publication and Israeli Arabs found the poem racist and offensive; they claim it would lead to incitement and ill-will towards Arabs. "Ahmed and his friends could be wealthy and sunny, if only they wouldn't buy rockets with all their money"
The child clearly doesn't hate Arabs and he plainly admits that they could live a much better life (and could we) if they wouldn't lob rockets at us daily. They would have plenty of fuel in the Gaza strip if they didn't try to constantly bomb the crossing terminals. They would have continuous electricity if they weren't actively trying to kidnap IDF soldiers, infiltrate into Israeli communities, smuggle thousands of weapons into Gaza from Egypt and Iran...and of course, releasing kidnapped IDF soldier Gilad Shalit wouldn't hurt. YNET even brought this issue to the attention of Israel's Education Ministry...so who does YNET and the Israeli Arab community blame? Ibrahim Abu-Shindi, who manages the Arab community center in Jaffa, said the blame lies squarely on the shoulders of the State and its leaders. "I'm not surprised by this story because all that Jewish children know from television is the Hamas man as a terrorist and a murderer." According to Abu-Shindi, "the Education Ministry does not invest in bringing people together at all. There used to be a department for democracy and co-existence that did much to bring Arabs and Jews together, but it was canceled. They send Jews to meet their Jewish friends from America through the 'Taglit' project, but they never get to know the Arabs that live only a few meters away." The poem, in his opinion, creates a problematic state of events. "Placing this poem in a booklet is very serious, and encourages other children who think like this boy. If you want to bring people together you need stories about encounters and hope, otherwise you encourage hatred." Ah yes. It's the poem that encourages children to think that Ahmed and friends are trying to kill us. You wouldn't get that idea from watching TV, listening to the radio, or G-d forbid, speaking to residents of Sederot, Ashkelon, or the surrounding Israeli communities. In fact, kudos to this child for even being aware of the problem. The booklet's editor and poetry competition director Marika Berkowitz was surprised at the protests. "This is the boy's creation and this is what he wanted to express. Of course there should be a limit, but I think the there is no racism here. 'Ahmed' is a general term for the enemy. These are the murmurings of an innocent child. "There has been no intention of harming the Arab sector, but rather a specific terrorist – Ahmed. We didn't want to offend a specific population and I don't see anything out of order in this poem. We have had Arab students compete in the competition in previous years." Of course, the best line of all comes from the Education Ministry, "the local authority that published the booklet should have guided the students in a more correct manner through the schools. The district will investigate the issue with the local authorities." Why let reality get in the way of Yuli Tamir's Re-Education Ministry's agenda? Be sure to check out Haveil Havalim #168- The Celtics Must Lose Edition! Without a doubt, the Festival of Shavuot is intrinsically connected to the conversion process towards Judaism -- through the inclusion of reading the Book of Ruth on Shavuot. א:טז ותאמר רות אל-תפגעי-בי, לעזבך לשוב מאחריך: כי אל-אשר תלכי אלך, ובאשר תליני אלין--עמך עמי, ואלה-יך אלה-י. 1:16 And Ruth said: 'I implore you not to leave me and to return from following after you; for wherever you go, I will go; and wherever you lodge, I will lodge; your people shall be my people, and your G-d, my G-d.
With these words, Ruth the Moavite joined the Jewish people. 1. Part of the book deals with the annual time period קציר השעורים "the harvest of barley", which dovetails nicely with the agricultural aspect of Shavuot. 2. King David, the great-grandson of Ruth was born and died on Shavuot. Boaz and the people of Beit Lechem towards the poor. The Book of Ruth not only demonstrates that converts can be accepted into Judaism, but that its a commandment to demonstrate kindness towards converts. And if a stranger dwells with you in your land, you shall not do him wrong. The stranger that dwells with you shall be to you as the home-born among you, and you shall love him as yourself; for you were strangers in the land of Egypt: I am the L-rd, your G-d. Yet the Torah explicity states that a Moavite and Amonite may not join the Jewish people. Twenty-one years ago last week I was converted through a halachic Beis Din by 3 Orthodox rabbis. Their credentials and authority to do so would not be questioned. In fact, they are considered to have some of the strictest requirements for conversion. My desire to be a Jew was preceded and nurtured by years of study. My desire to be a Jew was not based on love for any man or for money, prestige or power. It was – and is – purely out of love for G-d and the truth and wisdom of Torah. Never, ever have I felt that it was hard to be a Jew. Quite the contrary, I cannot fathom how I would live the full, productive enriched life that I lead had I not accepted upon myself to live a life of Torah and mitzvoth which I strive to do every single day. In the last 21 years, I have been blessed with many and varied good teachers. I have sought them out, begging and bugging them for their time and knowledge to teach me halacha, Tanach, and the many other rich sources of Jewish wisdom. I have invested heavily to do so: A large library consisting of thousands of seforim that are opened and studied; a vast tape and CD library of shiurim by various rabbis and rebbetzins; and several trips to Israel for the sole purpose of immersing myself in learning. Speaking of children, my 13 year old daughter is and has always been enrolled in Orthodox Jewish schools. So has my 10 year old son who is currently in what would be considered a “Chareidi” track of more intense Torah learning. Both children are good students, B”H. Both children present us with report cards that speak of their middos tovos and strong derech eretz. During our 15 years of marriage, my husband and I have supported, to the best of our ability, various Torah institutions both in N. America and in Israel, with our time as well as with our money. In a few weeks, my family and I are moving to the West Bank where we intend to raise our children, enroll them in Chardal-oriented schools, and live out our lives as Torah observant committed Jews. And now, for absolutely no reason, no crime committed, a group of rabbis who have never met me or my children wish to throw a dark cloud of suspicion and doubt over the legitimacy of our Jewish souls. The Beis Din who converted me 21 years ago is considered Chareidi. Its Vaad HaKashruth is recognized by all major Kashruth bodies. Its conversions have never been questioned and their converts have married into mainstream Orthodox Jewish society. This Vaad initially appeared on “The List” – the list issued by Israel’s Rabbinate of Who is Recognized to Do Conversions, or some paraphrased equivalent title. However, for various ugly reasons which have to do with one person’s desire for revenge, the Vaad who converted me 21 years ago was now removed from The List. A discussion and meeting with Rabbi Shlomo Amar by my rabbi resulted in assurances that “they were looking into it and, in any event, all conversions prior would be retroactively recognized”. So, according to Rabbi Amar, I’m still a Jew and so are my kids. That is – until the next rabbi comes along and decides something else. At what point do my children and I no longer have to even think that somebody would unilaterally and arbitrarily remove the cloak of Torah and Jewish identity out of our definition? How many years – 30, 50, 100 – never? Does this mean that if I ever speak a drop of lashon hara, or some of my hair peeks out from under my tichel, or my elbows become uncovered, or I wear my sandalim without socks, – that I must reckon with someone’s claims that this is sufficient evidence to disclaim my Jewish soul? These are not dramatic questions. To top it off, CrossCurrents jumps into the fray, praising the Beit Din that is retroactively revoking all the conversions of R' Chaim Drukman. Orthodox rabbis have long criticized heterodox rabbis for not informing “converts” that their conversions will not be recognized by a large segment of the Jewish world, and thereby paving the way for future tragedies. And the same can be said of an Orthodox rabbi who follows a single opinion against the overwhelming weight of historical and contemporary halachic decisors. Retroactive Revocation of Jewish conversion for hundreds, if not thousands of people is to be looked at with extreme care and caution -- not callous and haste. The High Court of Conversions would be best to carefully reread the Book of Ruth this year. Having reviewed the ruling of the Bet Din Elyon in detail, and being fully mindful of the respect due the rulings of duly constituted rabbinical courts in their respective jurisdictions, the RCA finds it necessary to state for the record that in our view the ruling itself, as well as the language and tone thereof, are entirely beyond the pale of acceptable halachic practice, violate numerous Torah laws regarding converts and their families, create a massive desecration of God's name, insult outstanding rabbinic leaders and halachic scholars in Israel, and are a reprehensible cause of widespread conflict and animosity within the Jewish people in Israel and beyond. The RCA is appalled that such a ruling has been issued by that court. We have been assured by Israel's Chief Rabbi Rav Shlomo Moshe Amar, who is also the President of the Rabbinical Courts System of Israel, that in releasing this ruling the court in question directly countermanded his instructions and policies. He has confirmed that the ruling has no legal standing at this time. We commend Rav Amar for his positive role in this matter since its very inception in the Ashdod regional court. We add our rabbinic voice to those of others who have called for a thorough review and repudiation of the actions of a select few of the Bet Din Elyon, who in this ruling as in other previous instances, have sought to undermine the Conversion Authority. I have to say that I'm stunned (and not much stuns me anymore). PM Olmert's office decided to exploit the absence of Rav Amar to summarily fire Rav Druckman, on the pretense that he was 75 years old. This, to put it mildly, is a very lame excuse. Exceptions to the various age limitations are made all the time. One classic example, the founding conductor of the IDF orchestra was kept on the job for over thirty years after he was supposed to retire. We are a country that specializes in making exceptions. Without sounding extreme, I can't help but think that Olmert sacrificed Rav Druckman in order to secure the support of Agudat Yisrael and Degel ha-Torah and Shas to support his survival in office. (If Olmert has already given away the Golan in order to avoid problems, what a conversion authority?) His statements against Rav Druckman, and his swipe at the National Religious community that they will soon become Reform, are not only disgusting per se, they are disingenuous. None other than Rav Ovadiah Yosef has ruled, הלכהלמעשה, that if a non-Jew converts and agrees to some sort of traditional lifestyle, the conversion is valid. I have it on the best authority that he has expressed support for Rav Druckman's efforts. So what is this? Political grandstanding on the backs of the converts. Entire psak translated by The Rebbetzin's Husband. One of the main arguments put forward by R. Avraham Sherman against R. Druckman's conversions is that R. Druckman signed on conversions at which he was not present. This was a technical matter since it is not disputed that three dayanim were present at each of those conversions. As they say: kol haposel bemumo posel. I am holding in my hand a document written by the Commissioner of Complaints against Judges, Tova Strassberg-Cohen, and signed by her on March 31, 2008. The document is a response to a complaint against a panel of dayanim sitting on a case involving a divorce dispute. The whole panel seems to have been out of control: they heard testimony in the presence of only one side, neglected to keep protocols, and so on. But the main complaints involve the aforementioned R. Sherman (RAS). First of all, RAS failed to disclose that one of the lawyers appearing before him was at the same time representing his daughter in front of another court. When this was discovered, he was asked by Rav Amar to cease hearing the case. RAS simply ignored Rav Amar's request. Second, RAS signed the ruling despite not attending a session of the court at which testimony was heard. 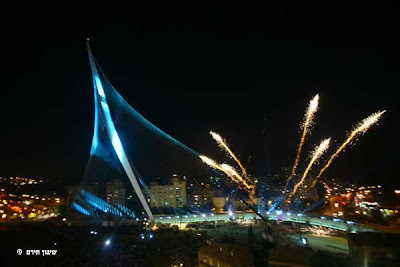 JBlogosphere Salutes the Israel Day Parade!